One of India’s youngest author a 12 year student Vishnu Priya Soma has penned down her 1stbook “ A forest Adventure –Bugs life series “ within span of two years. It was released today by DrArunaVasudev, eminent author and film critic here today. “I’m always looking at & getting inspired by my surroundings, especially the tiniest creatures, which play a very important role in our daily lives as well as our eco system. Thinking like them was quite a challenge but an enjoyable one. Being in their world, and constantly trying to find the perfect balance between the real & virtual was quite a roller coaster ride, I must admit. To think and feel like them improves your sensitive side towards the nature which is very important for the very existence of our world today. My brother Prithvi is my inspiration & on him only is the main character of my story “Ash” is based on.” says Vishnu Priya. 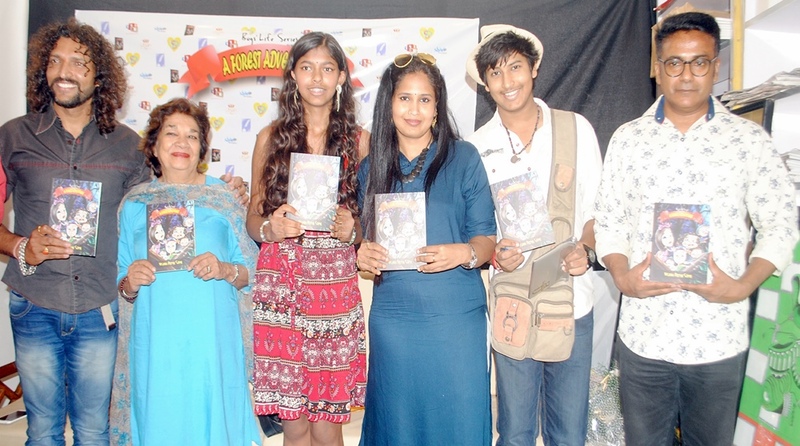 Vishnu Priya’s father designed her book. Her mother painted author’s portrait & her brother Prithvi was biggest her inspiration & support. The most important part of Vishnu Priya’s journey is that she worked very hard yet enjoyed it completely balancing her school & her passion. This young genius is on the verge of finishing the Second book in the same series. She loves reading adventures & mysteries, while still holding onto elements from works that inspire her the imaginary characters in particular.The most important part of Vishnu Priya’s journey is that she worked very hard yet enjoyed it completely balancing her school & her passion. While she takes english as her favorite subject, these days Vishnu Priya sees herself primarily as a writer. She loves playing Badminton, Basketball & watching mysteries & adventures.And it’s high time we ​together initiate the SAVE BUGS CAMPAIGN. says Vishnu Priya. Please join hands with me.” That an 11 year old can write a coherent book is a rare accomplishment in itself. But Vis​hnuPriya’s book goes beyond that because it is not just telling a story in a riveting manner but it also has an underlying message which will stay with the kids and even adults – who read it. To combine entertainment with knowledge and information is the truly remarkable feat Vis​hnu Priya has accomplished. And to cap it all, the illustrations and design are utterly charming.ArunaVasudev. Sonakshi Sinha launching a product in Delhi. Release of book on “Eminent Indian Scientist” on 13th Dec.